I was in one of my Kitchen MacGuyver moods one Sunday morn. I had a 1/3 of a bag of wilting spinach, half a container of little cherry tomatoes that were staring to shrivel and my last 6 eggs in the fridge. If anything will make me feel like an Iron Chef, it’s one of those situations. I’ve become very fond of making frittatas because they are so versatile. They are a great vessel for those little bits of leftovers, cooked or uncooked, that you need to use up in the fridge. You can also save leftover slices and have a tasty breakfast ready to be warmed up throughout the week in a matter of seconds. If you’re feeling particularly swanky, pair a slice with a salad for what the fancy people like to call a light lunch. Or if you’re strapped for cash (like myself), you can call it not-tuna-salad-again-because-I-get-paid-in-two-more-days lunch. One thing I have been sneaking into my cooking lately is this crazy blend of spices called Berbere. It’s a north African blend of spices that is really robust and give a complex and distinct flavor. It has lots of cayenne pepper, turmeric, ginger, garlic, and a few other things. I picked up some at Penzy’s, but any specialty market might have it. If you can’t find it, a good pinch of cayenne pepper and turmeric might do the trick. Side note: Remember to use a pot holder when removing your pan out of the oven and after. Maybe you all are smarter than me, but I can’t stop burning myself because I keep forgetting that the pan came out of a 375 degree oven and I just grab it as if I were making an omelet or something. 1. Preheat your oven to 375 degrees. 2. Heat your garlic and oil in an oven-safe pan over medium-high heat. 3. Just as the garlic starts to get a bit of brown, add your tomatoes and spinach. Sprinkle in the Berbere spice and toss to wilt the spinach and cook the tomatoes. 4. Whisk together your eggs and egg whites. Add them to the pan. 5. Gently stir the bottom of the pan with a spatula to move the veggies around in a uniform layer. 6. After the eggs cook for about 4 minutes on the stovetop, place the ovenproof pan in the oven to cook the eggs longer. Bake for 10 minutes, until the eggs have set. 7. Remove the pan from the oven and slide out the frittata on to a cutting board for cutting. OK, so this isn’t really palak paneer in its most traditional sense. I happen to have a great Indian food crock pot book called The Indian Slow Cooker by Anupy Singla, so that is a great modern convenience. Secondly, I’m not making the homemade cheese (the paneer). Instead I’m throwing in cubes of firm tofu to give me my needed protein for a balanced meal. One of the reasons I love this dish is that it’s very different from what I’m usually cooking. I’m no vegetarian, but it is nice (and cheaper) to make some meat-free options throughout the week and it also gets me a healthy portion of veggies into my diet. Ingredients such as spinach, turmeric, tomatoes, garlic and ginger have all been linked with good health. There is also no added fat! But my favorite part about this recipe is that it makes a large batch that you can portion out and freeze for those days when you need to bring your lunch to work or have just enough time to heat something up for dinner. Tuesday nights I only have about an hour to eat and grab my skate bag between work and practice. These kinds of recipes keep me on time for practice and fueled for 2 hours of skating. Throw everything into the slow cooker, except for the salt. The spinach will give off a lot of liquid, so even though you might not be able to fit the lid on everything will end up cooking down. Cook on High for 3 hours, stirring occasionally to push down the spinach leaves. 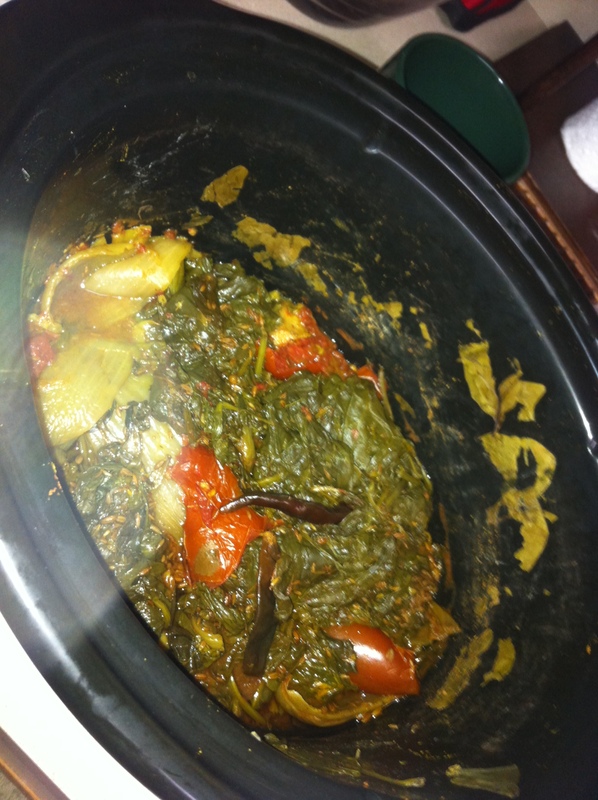 Cooking palak paneer in a slow cooker. Transfer the cooked-down veggies into a food processor or blender. If using one of these, do use a tea towel to cover the hole in the lid. Never blend hot stuff in your blender with the lid sealed… Unless you enjoy cleaning. If you have an immersion blender, feel free to use that Fancy Pants. Puree until you have a nice, smooth consistency. Pour back into the slow cooker. Add the salt and continue cooking the puree on Low for another 2 hours. Add your cubes of tofu when you’re ready to serve. This is best served over a bowl of basmati rice or quinoa, millet, or other grain. 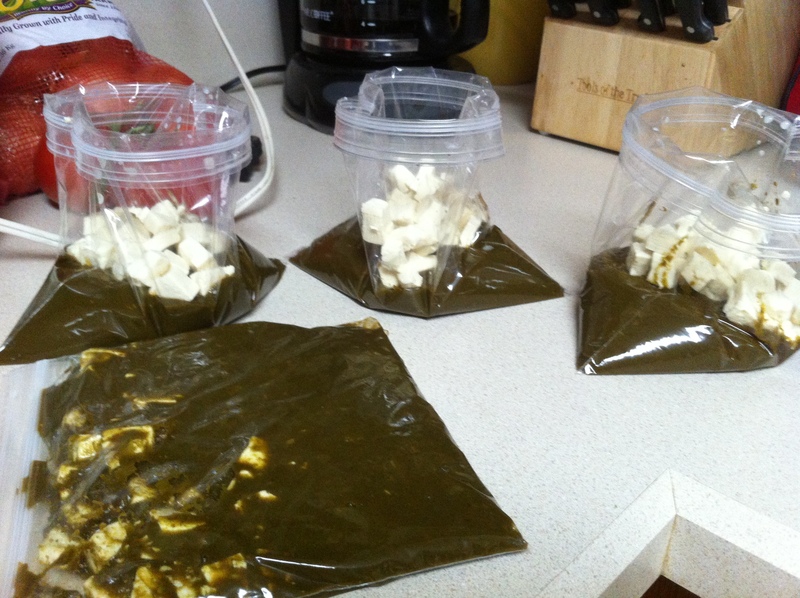 To store, I like to pour single servings into bags, top with tofu, and store in the freezer for a quick dinner later.